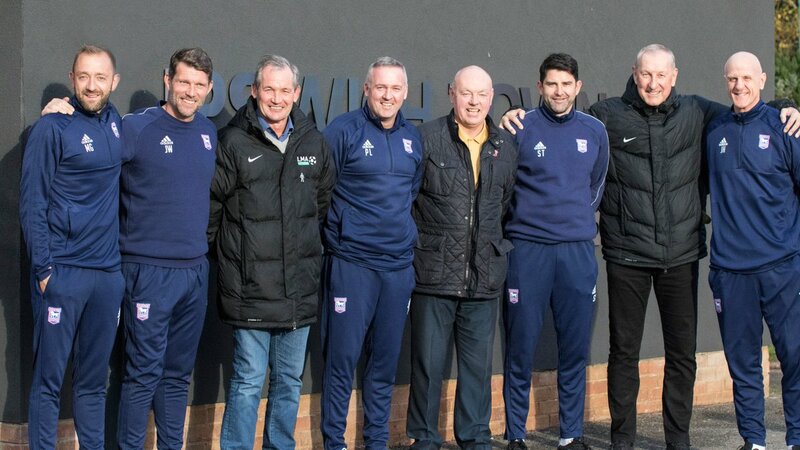 Paul Lambert believes it’s important for a club to embrace its heroes of the past, the new Blues boss having invited Terry Butcher, John Wark and George Burley to have lunch with him and his staff at Playford Road yesterday. Asked why he asked them to come in, he joked: “To see if they could still play the game! I tried to sign Wark but I couldn’t get him! “They were iconic players for this club and sometimes I think older players can get lost and made not to feel too welcome and I thought that we have to bring the guys back, they were a huge part of this club’s success. “Not many teams have won a European trophy, not many teams get it. You see how hard it is to win it in the modern day game but they did it which is an incredible achievement. The FA Cup as well. “But I think it’s important when you have that success [that they’re made to feel welcome], especially iconic players that did it. “It was great to see them. I knew Terry from a little bit of TV stuff I’ve done with him, George I knew from the LMA [League Managers Association] and playing against him in managerial terms and John Wark, I really just wanted to meet him because I wanted to know what his lines were in Escape to Victory! And then when he told me I thought it was brilliant. And my God what a player he was. “I was delighted to see them, I really was, and it’s important that the door is always open for those type of players. He says those players and their achievements should be used as an inspiration to the current generation rather than daunting them. “I think there are two ways of looking at it, you respect what happened to you in the past, that never leaves the football club and the history of it,” Lambert, 49, added. “But we have to have a chance and the only way you can have a chance is to start somewhere and everybody has to give us a chance to make our own little bit of history. “In this moment we’re not in that moment the way the Butchers and Burleys and Warks, Mick Mills, all those guys were, we’re nowhere near that level but we have to be given a chance. Quizzed on what was discussed with the legends, he said: “We spoke about everything. I grew up in an era watching them guys so I knew the teams that Ipswich had, especially that era, they were obviously a well-known famous team. “We spoke about everything that’s gone on and what’s happened but not just totally focused on Ipswich, we were talking about the national team, the Scotland team and Terry’s time with England, the Maradona goal and things like that. “There was loads of good banter and good conversation and then obviously you have your serious stuff - what’s it like? What’s been happening? Have they enjoyed the games? Lambert, who attended last Thursday’s Supporters Club AGM, believes it’s important for an incoming manager to immerse himself in the history of his new club. “I think you’ve got to grasp it pretty quickly,” he continued. “I was fortunate I was grew up in an era where I knew the Ipswich players for the success they had, and obviously Sir Bobby Robson. “I knew that era and I knew Thijssen, Muhren, I could go through them all without anybody even saying anything to me. “I knew exactly what type of side they had and that era should be iconic because it was an incredible time they had at the club. “When you have the iconic players who have done so much for the club and all of a sudden they get lost to it and maybe don’t feel as welcome as maybe football should make them feel, it’s important [that they are made to feel welcome]. “When I played at Celtic, the great Lisbon Lions team, great guys, top, top guys, the first team British to ever win the European Cup [in 1967], [all but one] from an 11-mile radius from the club, will never be done again. “And quite rightly they came in and you still see people like Bertie Auld and John Clark, Billy McNeill, great legends of the club, should never be diminished because they put it where it was. “You respect it and you have to move on but you can’t keep coming back to it because we’re not there in that moment, our current team is not there in that moment. “But they deserve respect those players and when you see them at stadiums and games, it’s nice and it’s important. Was Wark, a fellow Glaswegian and central midfield player, a particular hero when Lambert was growing up? “I knew John Wark scored a helluva amount of goals, an incredible amount of goals, dear oh dear! “And then he got his move to Liverpool and did exactly the same there. Ipswich had George Burley, Alan Brazil and John Wark, Scottish internationals. “Then John went to Liverpool with Kenny Dalglish, Graeme Souness and Alan Hansen so being Scottish you look at where the Scottish players and who is doing what and John Wark scored so many goals. “You’d love to know what would be the transfer value now scoring 36 goals in a season, that’s incredible, and meant to be a sitter. Incredible the amount of goals. “I’m not being funny when I said that I genuinely wanted to meet him because of Escape to Victory. I can see him now, he only had two lines and they were dubbed. You couldn’t have pictured that, a Glaswegian accent being dubbed, which was brilliant! Love this it shows not just a want to know the history but he seems to genuinely love it. Time for this man to make a dynasty here and become a stalwart for the club. I'd like to 'embrace' them by taking George, Terry and John out for an Indian for all they've done for the club over the years...so lads if any of you are on browsing TWTD and fancy a free Bhuna or Vindaloo! - but I'm sure they eat at more refined places. In all honesty if we go down we must keep Paul Lambert, this is the most excited I’ve been since Joe Royle, something special is about to happen to the club I love. This man has done nothing but impress me since his arrival and fill me with confidence for both the short and the long term future of our club. I think I'm already seeing the shoots of a long and successful career here for Lambert regardless of what happens this season. "I wanted to know what his lines were in Escape to Victory"
This guy is such a breath of fresh air. His playing career included over 7 years with his local team, St Mirren, and after the upward trajectory spells at Motherwell and Borussia Dortmund, he was again around 7 years with Celtic. Each club he was with was seriously (and differently) successful while he was there. He seems to understand with crystal clarity from these experiences as a player just how important their club is to its fans, himself as fan included. And what excites me most is that he can clearly project this idea of connection onto Ipswich Town, fully aware of the great history, and how it inspires such loyalty also among many, often great, ex-players - who feel an abiding devotion, and enjoy and suffer just as we do. I think that Paul Lambert's presence is perhaps also encouraging us to change the tone seen on TWTD in the past couple of years. I was one of those who desperately wanted the McCarthy era to end. We now desperately need to view that era - including both positives and negatives - as finished, and to look forward to seeing, and even, as seems clear, to being part of a Lambert era. Like all managers, he needs time. And my feeling is that he deserves it more than most. Up the Town. Here is a proven manager who has finally found a club with true legends and heroes from his childhood he wants to live up to and maybe surpass. Bring it on Mr Lambert, I for one, am behind you! He's nailed his entry to the club, like the author of the textbook on it. I feel bad for him he doesn't have the quality in the squad to match his own skill. We need the quality we have playing at 150% between now and January, and then some serious reinforcement. Good luck Paul, get behind him, fans! Can you remember when Keane took over? one of the first things he did was lock up Playford road to keep any of the old players from wandering in. That's the calibre of person we've had to put up with at the Town recently. At last we seem to have someone to embrace and benefit from these legends. Paul is here to take us down and bring us back up a stronger club. I live near Norwich and I am always reminding locals that we are the bigger,more successful club.FA CUP,UEFA CUP and DIVIION ONE champions. The two most successful ENGLAND managers and the biggest ground. I as child was at our biggest att 38010 versus Leeds 1972 vs cup 6th round. What a day. I am now 52 and took my 10 year old son to his first game on Saturday v preston. Up until now he has been Farm tractor mad, now he's a tractor boy. He loved it!!!!! He had his photo taken with Terry Butcher and has Kevin Bertie as his screen saver! Come on you blues and fight for every point. Lambert has a tough job but if we go down i genuinely believe he will stay and bring us back up. What an amazing turnaround this club has received and all thanks to Paul Lambert. At last, a manager that “ gets it”, and sees the Club , our history , our achievements, for what they are, and seeing it ALL from the Fans perspective!! Paul Lambert , Sir, you have been sent to us from a Higher Authority to save this Great Club. Thank you. Paul Lambert is A BLUE ! !